If you want to know how to stay calm when your child is yelling at you, and how to control anger with your child when this happens, you’ve come to the right place. As much as we strive to be the perfect parent to our children – the kind who is fun and spontaneous, who enjoys playing with her kids for hours on end and doesn’t bat an eyelash when they are sick, cranky, and crying half of the night, who always puts her kids needs before her own, and who never, ever needs a break – the reality is that even the most grounded and patient of parents has moments in which they lose their temper. Of course, some parents lose their cool more frequently than others, but we all have moments with our children that we later wish we could take back. You know the moments I’m talking about– the ones where we raise our voices, say hurtful things, threaten punishments we know we won’t follow through with, roll our eyes, and emotionally check out at a time we know our kids need us the most. But if we’re completely honest with ourselves, it’s rarely the ONE thing that happens right before we lose our cool that sets us off. Nope. It’s usually a combination of many different things that have been building up over the course of the day that gets our blood boiling, but since we aren’t always rational when we’re angry, we blame our outburst on the ONE thing our child did right before we erupted. And then we feel guilty as hell for the rest of the day. And if you are the parent of a special needs child with ADHD and/or a developmental delay like autism, sensory processing disorder, or oppositional defiant disorder, I think it’s pretty safe to assume that you experience these moments more than most. Whether your child is struggling to focus when you need her to stay on task, talking at you incessantly when you’re trying to concentrate on something important, or having a full-on sensory meltdown in public, it can be really hard to stay calm as a parent, even though you know in your heart that your child is struggling and the behavior you are witnessing is not her fault. The good news is that you are not alone. Whether you are the parent of a special needs child, or your children just have a way of making you feel as though you’re going batty, there are many (many) other parents who struggle just like you do, which is why we’ve put together 9 helpful and effective tips to teach you how to stay calm when your child is yelling. SET LIMITS AHEAD OF TIME. If you struggle to stay calm as a parent and know the things that push your buttons, be clear about rules and expectations, and enforce logical consequences when these are not followed. By explaining what the rules are, what’s expected, and what is and isn’t appropriate, and taking the time to give your child regular reminders, you are setting her up for success. The easier the rules are, and the more consistently you reinforce them, the easier it is for your kids to meet your expectations. If you’re the parent of a special needs child, create house rules for your child, and use visual schedules to ensure they remember what is expected of them. CLICK HERE to learn how you can learn logical consequences to naturally encourage better behavior with your children. DON’T REACT. If you want to stop yelling at your child, taking a 5-minute breather to calm yourself down after your child has behaved poorly can make all the difference. As soon as you notice those familiar feelings of anger, make sure your child is safe and then remove yourself from the situation and take a few deep breaths. When you feel your heart rate returning to normal, consider the situation that just occurred and your reaction to it. Is your child legitimately misbehaving, or is she feeling overwhelmed? Are you distracted? Is her behavior simply a plea for your attention? Did your child make you angry, or did something else upset you? Will lashing out at your child solve anything other than your need to release your anger? Taking a few moments to really consider these things will help put things in perspective so you can react appropriately. Remember that we are our child’s biggest role models, so exercising proper self-control can go a long way in teaching your child acceptable coping skills. Don’t be afraid to verbalize what you’re doing (‘I’m feeling angry right now, so I am going to take 5 minutes to calm down before I respond to you’) so she has a better understanding of the strategies you are using to stay calm as a parent. THINK BEFORE YOU SPEAK. A great tool to help you stay calm as a parent and control anger with your child is to simply think before you speak. When your child is misbehaving or having a meltdown, sometimes one of the best things we can do is to remain silent until the behavior has passed and we’ve had a chance to calm ourselves down. The problem with reacting in the moment is that we often say things we cannot take back later. We may agree to things our child is asking for simply to keep the peace, threaten punishments that don’t align with our child’s behavior, or say mean things as a way to get our own anger out, but if we make a conscious choice not to speak until we can think rationally, everyone will be better off. You won’t negatively reinforce your child’s behavior, can punish her appropriately if needed, and will avoid unnecessary feelings of guilt later. RESIST THE URGE TO VENT YOUR FRUSTRATION. Yes, venting is therapeutic, but when we engage with others immediately after something upsets or angers us, we tend to say things we don’t mean and our emotions often escalate instead of dissipating. A much better strategy to control anger with your child is to take a time out to reflect on your feelings and resist the urge to talk to others until you’ve properly calmed down and have a better handle on your emotions. Take 5 deep breaths. It’s no secret that taking deep breaths can help restore a sense of calm when big emotions hit, but when our hearts are racing due to feelings of anger, our breathing is the farthest thing from our minds. Taking the time to focus on our breathing can calm the physical symptoms of anger, allowing us to feel more in control. Count to 10. If deep breathing isn’t your thing, counting to 10 has a similar effect in that it forces you to stop and focus on something else rather than reacting in the moment. Journal. Having a safe place (a plain notebook will suffice) where you can write down your feelings freely so you can express your anger in the moment is another great anger management technique for some, but if there’s a risk your child, spouse, or other family member might read what you wrote, considering using a gratitude journal you can write positive things in instead to try and alter your mood instead. Do something productive. Anger can leave us feeling agitated, tense, and irritable, and finding a productive way to expel some of that negative energy can make a world of difference in restoring a sense of calm. Organize a closet, fold a load of laundry, or do the dishes to help bring yourself back to a place of calm while your child is yelling at you. DISCUSS WHAT HAPPENED. Once you and your child have calmed down, set aside some time to discuss the situation that transpired together, but be sure to do this in an open and calm environment. This is not a time to discipline or shame your child – it’s a time to work together to figure out what caused the behavior to occur in the first place, discuss how you both handled the situation, and come up with solutions for the future. Did something happen at school that upset her? Is she in need of more one-on-one time with you? Is she nervous about an upcoming event? The more open and honest you are in the discussion, the more comfortable your child will be in admitting the reason behind her behavior. APOLOGIZE. No matter how hard you try to learn how to stay calm when your child is yelling, there will still be days when you lose your cool, leaving you feeling both guilty and annoyed with yourself. When this happens, make it a point to be a positive role model and tell your little one that you’re sorry. Acknowledge your mistakes, come up with a plan on how you can avoid a repeat of the situation, and then move forward. When you take the time to admit when you’re in the wrong, you not only help repair the damage created with your child, but you also encourage her to do the same when she loses her cool with you or someone else. START AGAIN. Another great strategy to help you stay calm as a parent is to give yourself and your child permission to start over. Whether your child is struggling with something in particular, or you are both just generally in a bad mood, making a conscious decision together to restart your day can be extremely empowering, not to mention fun. Once the big emotions are out of the way, suggest that the 2 of you go your separate ways for a few minutes and then try again. If your child had been struggling with something in particular, like asking you for something using a calm voice and good manners, give her the chance for a do-over. If you’re both just in a crabby mood after a hectic and overwhelming day, you may even suggest crawling back into your respective beds for a couple of minutes, and then get up and greet each other as if it’s a completely new day full of hope and optimism. Don’t be afraid to make this exercise silly and fun. Laughter is often the best medicine, and as long as you found a way for your child to learn from the situation, finding ways to put it behind you both will go a long way in helping you end the day on a more positive note. Antecedent: The events that occurred before the behavior happened. Behavior: Your child’s response to the antecedent. Consequence: What happened after the behavior to either encourage/hinder a repeat of the situation. The idea is to track the same behavior multiple times to determine if there are any consistencies, and then formulate a plan to change the antecedent and/or consequence to ensure the poor behavior stops happening. You can also use this tool to determine if the antecedent and/or consequence is out of your child’s control (i.e. sensory sensitivities) or if your child is just being a kid and acting out. Kirsty Lee once said, ‘Counteract conflict by connection and communicating calmly’. Along those same lines, Robert Brault also said, ‘A child seldom needs a good talking to as much as a good listening to.’ I love both of these quotes as they are a good reminder that behavior is communication, and that the poor behaviors we see in our children are typically only the tip of the iceberg. There’s often a lot more going on beneath the surface, and it’s up to us to find a way to see and understand the drivers of our child’s behaviors before change can occur. Learning how to stay calm when your child is yelling won’t always be easy, but with a little practice and perseverance, I hope these positive parenting tips will inspire you. 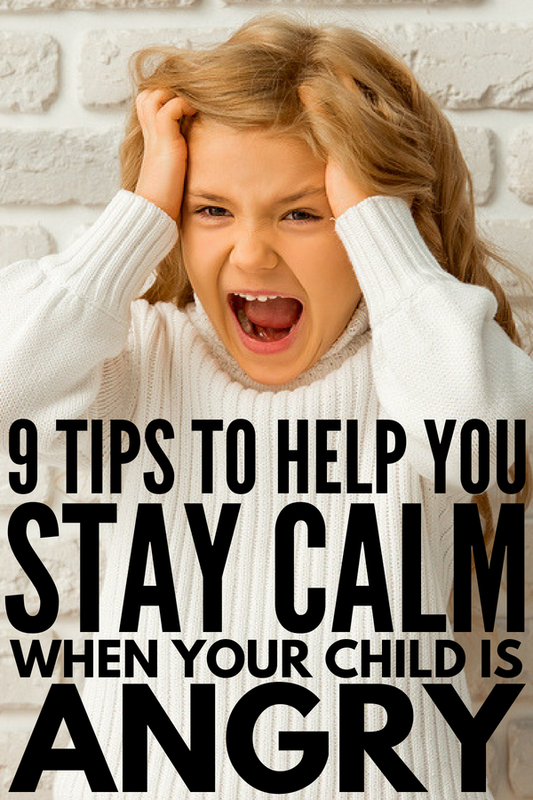 If you found these tips to learn how to stay calm when your child is yelling helpful, please share this post on Pinterest! And if you’re looking for more parenting tips and tricks, please follow our Parenting board where we share all kinds of great ideas we find each day!